varies greatly from person to person. An attack lasts between 4 and 72 hours. The headache is severe, unilateral, pulsating (pounding) or is getting worse by physical activity. There is sensitivity to light and sound with nausea or vomiting. Migraine is a common disease. 25% of women and almost 10% of men will experience migraine attacks throughout their lives. Migraine usually starts in puberty and attacks become more frequent until 40-50 years of age, after which they again become rarer. Migraine is divided into two types: Common migraine and migraine with aura. Aura is the term used to describe a range of symptoms that occur up to one hour before a migraine attack. These symptoms also last under an hour, usually 10-30 minutes. When the aura symptoms are gone and the headache begins, the two migraine types are alike. 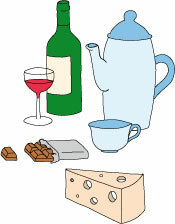 Food products (cheese, chocolate, coffee, red wine). Menstrual and other hormonal disorders. However, it is individual from person to person, what triggers a migraine attack. Visual disturbances. This is by far the most common aura symptom, and it appears as a small flickering area in the middle of the field of vision, which slowly spreads to one side as a semicircle. Within the half circle, there is a blind area. When the circle reaches the edge of the field of vision, the sight returns. The symptom can be quite intimidating if you do not know what this is about, but it is completely harmless. Sensory disturbances. These usually start in the face or in a hand or finger and then spread across the face or an arm and disappear by turning into visual disturbances after approx. twenty minutes. Other disorders. This may be the paralysis of an arm or a leg or difficulty speaking. In older people these symptoms can also be signs of stroke. Severe headache, usually on one side of the head. The headache is usually pulsating/pounding. Aggravation from movement and physical activity. Hypersensitivity to light and sound (to lie silently in a dark room is usually most comfortable). In migraine with aura the attacks are rarer, often occurring only a few times a year. Here the headache is also often more powerful than is the case in migraine without aura. Common migraine is more frequent. Up to several attacks a month is not uncommon. If headache cannot be remedied with ordinary headache medication it might be migraine. You should contact your doctor, who can usually make the diagnosis based on typical symptoms. Patients might identify the causes leading to attacks and avoid them. A headache/migraine diary where you write about attacks and what you were doing or consuming in the run-up to an attack might be a very useful tool to avoid or limit migraine attacks. Contraceptive pills can also trigger migraine attacks. It is important to remember that migraine is not a dangerous condition despite its unpleasant character. The treatment of migraine consists of two things, attack treatment and prevention of new attacks. For migraine without aura, attacks can sometimes be treated with common pain killer, such as Panodil, Aspirin or nausea medication. Otherwise, the most common treatment is vascular contracting medication. There are many different types, and perhaps different types should be tested to obtain the best result. However, caution must prevail and the medication only taken in consultation with a doctor as the treatment itself might lead to severe headache if taken too frequently or in too larges doses. If you have more than two attacks per month, and if attacks are so powerful that they are debilitating preventive treatment might become necessary. This may for example be beta-blockers. Preventive treatment should be closely followed by the general practitioner. Migraine is a volatile and very individual disease but it usually recedes with age.